“No filming here. Bad. Not here. You must leave,” he said in broken English as he shook his head side to side. He assumed I was an American, a bad sign. I took that as reason enough to split, muttered that I was a tourist in English, and stuck the camcorder back into my backpack. The man started to follow me as I walked away. I made a couple of quick turns into a few small alleyways, and headed into a busy marketplace. After blending in with the crowd I started to backtrack to see if the man had followed me this far. He hadn’t. I reached into my pocket and turned off the button cam and exhaled a little. I had the opportunity to take a two-week trip to France to shoot a series of undercover stories last October. The pieces finally aired last week, so I thought it might be appropriate to write about my experience. I was told before I went that this trip was unique, and that it would require us to be undercover to a certain degree. I spent a few days training in Virginia with our undercover video system, a button camera attached to a hard drive. It was recommended that I grow a beard (which was laughable as I have no facial hair), learn basic French, and dress like a European. Excited, peach fuzz on face and packed with two weeks of clothes and a light camera kit, my producer/reporter and I boarded a flight for Paris. Funny thing happened while in the air though, union strikes and subsequent rioting hit Paris hard. The government had proposed to change the national retirement age from 60 to 62 and overnight, across the country, unions started to protest and riot. We had planned on shooting a series of stories regarding the Islamization of France, and instead landed in a country that was in full blown protest. Obviously, we had to cover some of what was happening. 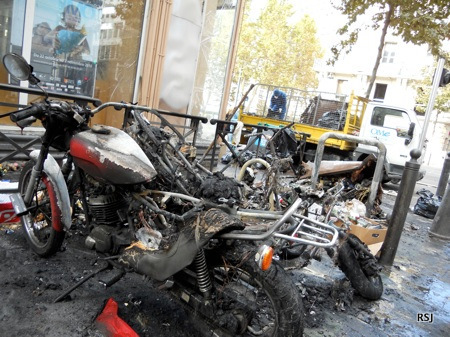 Scorched motorcycles sit after a day of rioting. The strikes and rioting affected the country in strange ways. Unions (garbage collectors, oil workers, other hard labor unions) simply quit working. The streets were filled with garbage, gas stations ran out of fuel, and organized strikes were planned all over the country. Some of the rowdier picketers turned to rioting, lighting tires, schools, and buses on fire. CBN story can be found here. 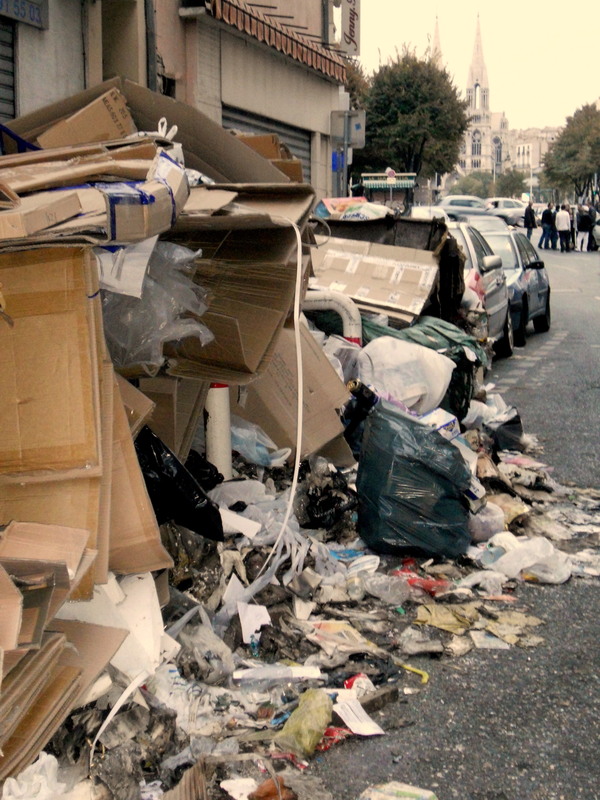 Trash piled high in the streets of Marseilles. That first night I ended up writing a quick article for BlogCritics, which can be found at the link below. I mostly argued that the garbage in the streets was symbolic of garbage in French economics. The welfare system in France is pushing the country into massive debt. We searched out a major protest planned for the next day. Police in riot gear lined the streets, staying close to riot vehicles and barriers. The crowds were mostly peaceful, and were made up of more students than actual union workers. Trying to stay out of the crowd’s way, I shot some footage, a quick standup, and footage of riot police. We were lucky to avoid violent protesters and didn’t see any tear gas or arrests. With the coverage complete on the strikes, we could work on our real goal. We met with our fixer, a woman who goes by the name Aquila France (she kept her last name a secret). She was raised in Algeria, and fled her home for a more peaceful (and less Muslim) France. She spoke Arabic, French, and English. She was well connected, with contacts that range from local politicians to grass root leaders. Our plans were set: I would wear the button camera, our producer would keep a two to three block distance, and Aquila would walk with me. Where we were going was not a safe place, and our goal was to get the kind of footage that other journalists had been violently attacked for. 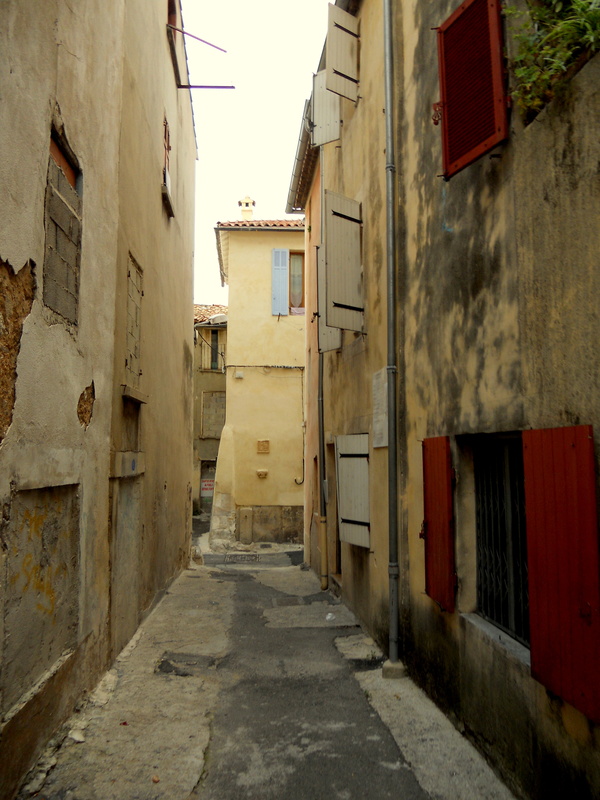 We had a long list of what the French call “Zones Urbaines Sensibles” or Sensitive Urban Zones. They’re also referred to as “No-Go Zones,” and France has 750 of them. These are, by definition, areas within France that are not controlled by the state. In other words, anything goes, and the police don’t dare interfere. A list of all 750 can be found here. Our goal was simple: find evidence that the French state was ignoring these “No-Go Zones,” and find proof that they were hot beds for radical Islam. We even went to Marseilles for a few days to seek out Muslim ghettos, poor areas that provided breeding grounds for Islamic extremists. Sadly, recent Muslim immigrants to France (mostly from Algeria), many of which have no money, fall prey to extremism. Most of the time our fixer was next to me, helping to navigate the rougher neighborhoods. Occasionally she would grab the back of my jacket and tell me it was time to leave, as she would overhear people talking about my camera equipment and how much it might be worth, and whether or not I was an American journalist. The most stressful moments were the ones spent outside a mosque on Friday during afternoon prayers. Mixed into a crowd of Algerian Muslims, I stuck out like the white American I am. Navigating the back alleys of Marseilles, I could feel eyes watching me, obviously my being there was more than the excuse of a lost tourist. But there were also a few areas that we were told would be highly dangerous, yet we found no evidence of extremism. In my opinion, one has to go no further than north Paris to see the effect of these Sensitive Urban Zones. And the issue goes way beyond just Sharia law. The fact that a state would allow so many ZUS’s to exist is an obvious example of excessive state tolerance of multiculturalism. This tribalism has grown out of the French people’s desire to allow people to live according to a multicultural creed, in other words, there is a lack of national identity. In all, the trip was a blast. 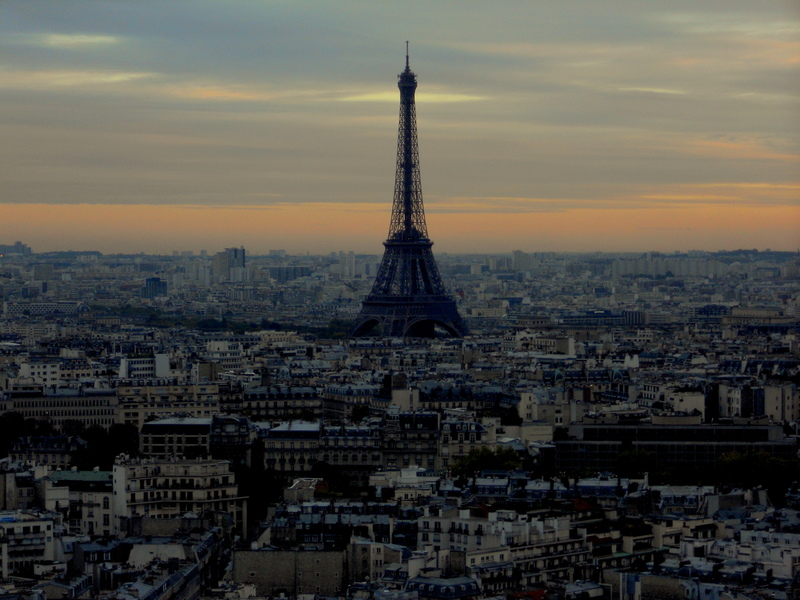 I spent time in Paris, Marseilles, and Nice. 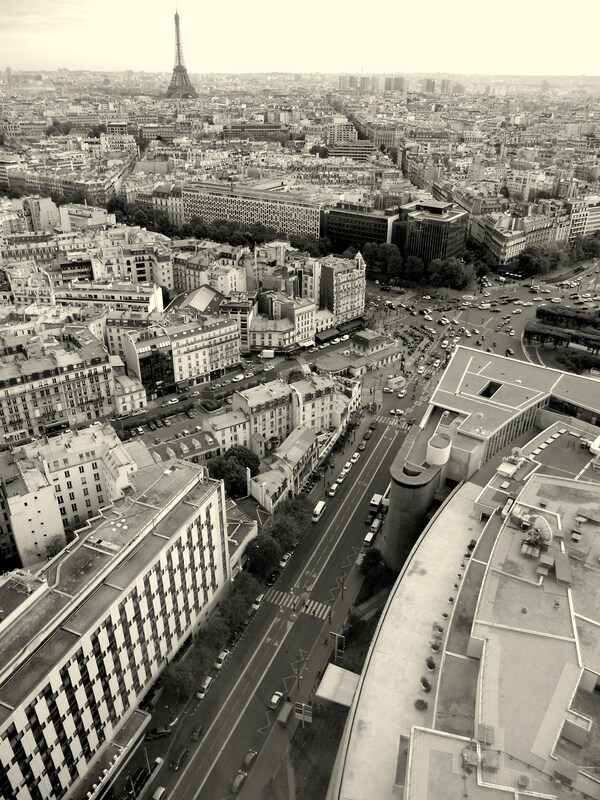 I was able to ride the high speed trains, navigate the subways, climb stairs to the top of the Eiffel Tower, see almost all of Paris on foot, and spend three hours at the Louvre. On top of that, I saw parts of France that most tourists don’t see: Muslim ghettos, No-Go Zones, deserted housing units, trash piled head high on street corners, wide-spread protesting, and burned out cars and motorcycles. I learned how to speak enough French to tell people that I didn’t speak French, and I developed a strong love affair for French espresso. Most of all, I consider myself lucky that no one caught me with my button camera. This entry was posted in behind a camera, CBN, International News, National News, Opinion and tagged assimilation, behindacamera, CBN, CBN News, france, french ghetto, french multiculturalism, french riots, halal, halal butcher shop, halal food, islam, islamization, marseilles, multiculturalism, muslim, muslim brotherhood, muslim ghetto, no-go zone, october, paris, Photography, riots, ryan johnson, sarkozy, sensitive urban zones, tribalism, welfare state, ZUS by Ryan Johnson. Bookmark the permalink. This is Awesome Young Man! I will diligently keep Praying God’s Hedge of Protection Around You. Thanks Grandma, it means a lot to me that you read my blog. And thanks for the prayer! Hopefully I can get a trip to Atlanta soon so I can see you! Is your dad Frank Johnson, who used to work at Focus on the Family? My wife and I just moved from Colorado Springs and I worked with Frank…He’s one of my favorite people in the whole world. He most definitely is. I found the link to your blog when you posted it on my dad’s FB page (which doesn’t get checked very often). I keep an eye on it for him. I’ve been trying to convince him to start a blog but my efforts are to no avail. Thank you for the compliment towards my dad, he’s one of my favorite people as well, and thanks for visiting my blog! I’ll be sure to check up on yours from time to time! I’m always looking for new contributors/articles for the blog. Are you still working for FOF? I figured the coincidence was more than a mere coincidence, especially after I read your post on Duke basketball and Steve Johnson. I am an enormous Duke fan and through Frank, knew you all were friends. I am no longer with Focus, I left probably right around the time your dad did, it was getting too chippy for me. My wife and I have moved to East TN, and boy do we miss Colorado. I’ll check out your other blog, our family has been praying for Jessica btw…Please send Frank my deepest regards. tell him GAT says hi.